Simple Stock Manager is web based inventory management tool designed for small and medium businesses/organization who can't afford expense solutions to manage their inventory. Create mysql database, database user and grant all permission to user for this database. Step 1: Pre-install system checklist - If there is any issue with checklist, you will need to fix it first to proceed to next step. 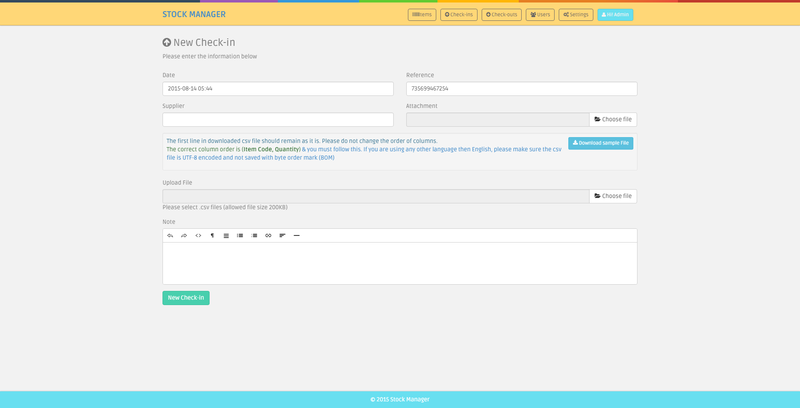 Step2: Provide you Envato Username and Purchase Code to validate the purchase. 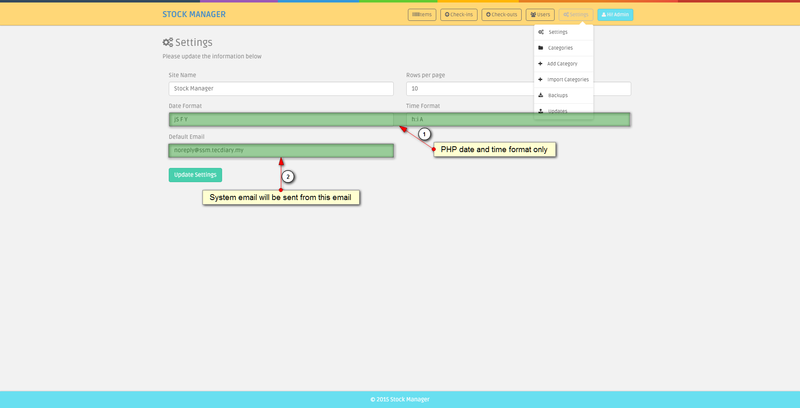 Step 3: Provide the database host, database user, database password and database name to proceed to next step. Please make sure you don't have $ sign in your password. If every thing goes smooth, You will be redirect to final page with login details. Login using default username and password and add new admin user before editing/delete the default user. 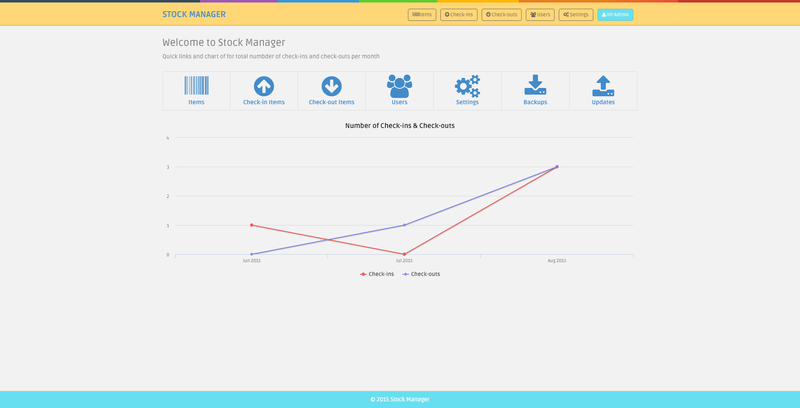 Simple Stock Manager is ready to use. There is no db change, so you are done. Thanks to all great people who are developing open source software. Font Awesome - The iconic font and CSS toolkit under GPL License. Thanks to all the friends for their suggestions, feedback and help. How to enable HTTPS support? Can I modify the item? Yes, you can modify the script as per your needs and license. We offer Regular License only that allows you to use the Item to create one single End Product for yourself or for one client (a “single application”). If you have more then once clients, you will need to purchase separate license for each client. You can visit this link to licensing faqs page of Evnato marketplace. Can I manage multiple stores? No, you can only manage 1 store with single installation. If you have more that 1 stores and want to use for all, you will need to purchase separate license for each store. Can I white label it to have my company name? Yes, you can. Please update the settings with site name. How can I translate into other language? You can easily add new languages to Simple Stock Manager. Please click here to jump to guide. Can I install this item on localhost with wamp/xampp/easyphp? You can install this item on localhost with any web platform xampp, mamp, lamp, wamp or easyphp. Internet connectivity is required for installation to verify the purchase. Once installed, you can use it without Internet. Does it supports barcode scanners? Yes, you can use barcode scanners with this item. Will I get the full source code? Yes, you will get 100% source code including php, js, html and css. Are you using a PHP Framework for this item? Yes, CodeIgniter – PHP Framework created by EllisLab and is now a project of the British Columbia Institute of Technology. 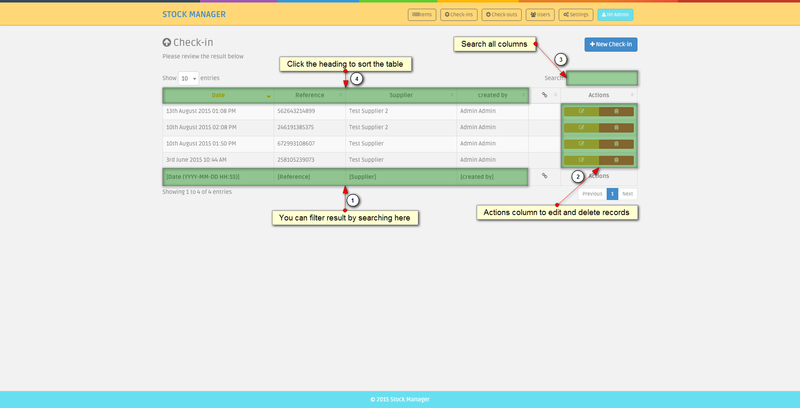 How do Simple Stock Manager track inventory? Once you have added the item, you can create check-ins to increase and check-outs to decresase the stock. Why I can check-out even if I don't have quantity? Once you add the product to order list, the item color will be red if you don't have quantity for the product. But Simple Stock Manager allows you check-out items even if you don't have quantity and will set the quantity to negative. Where are the header and footer view files? Why barcode images are not showing on print barcode and label page? Please check that ini_set function is not disabled. The ini_set function should be enabled to use barcode feature. What type of account are available? Admin - will have all rigths, and can erform any action. Staff - will have view and add rights only won't be able to edit any record along with users and settings. I am Admin and how do I reset the password for sales staff user? Please visit list user and edit the user to reset the password. If you want to delete account for staff member, please visit list users sub menu under people main menu. All the account are listed on this page and you can delete any of them. Why am I getting CloudFlare Security or Blank error on verification while installing the item? Updating your Anti-Virus and Browser might help. You can check with your host too. You can try different host and/or install it locally with any web platform easyphp/lamp/mamp/wamp/xampp. Why I am getting "no input specified" error after install/update? Please add the ? 'question sign' after index.php in the .htaccess file, you line will be look as RewriteRule ^(. *)$ /index.php?$1 [L]code. For more information, please visit this guide page. Why the installer/update tool is locked? After successfully installation/update, the installer/update tool will be automatically locked. If you having any issue after installation or like to perform the installation again, please upload the files again. Why am I getting 404/500 error page after installation? check your folders/files permissions (folders should have 755 and files should have 644 permissions). If you are using godaddy, please visit the codeigniter official guide here. You might need to check and modify you .htaccess files too. You can always check your error log to get more information about the issue. Why time is different from my computer time? Why I can't login and getting time out error? Timeout feature has been enabled. The user will be timed out after 3 unsuccessful login attempts for 10 minutes. You can disabled this in app/config/ion_auth.php by changing the $config['track_login_attempts'] = TRUE; to $config['track_login_attempts'] = FALSE; or you can increase the attempts from 3 to any number you like. Why I can't upload any file? Why I getting db error and can't login? Can I use this on Windows server with IIS? Yes but we haven't tested this and don't provide any support for setup. If URL Rewrite module is not installed, please install it from here http://www.iis.net/downloads/microsoft/url-rewrite. Please check the complete web.config file. Place this in the main installation folder where the index.php is placed. Can I use this with NGINX? You can follow the guide http://wiki.nginx.org/Codeigniter. Your nginx.conf file will look like this. # Check if a file or directory index file exists, else route it to index.php. Why some products are missing from order when I add 100+ products? There is no restriction in Simple Stock Manager on the number of order items. If you are having such issue, please check your php configuration file (php.ini) for max_input_vars and set it to higher number i.e, 10000. Why Wordpress showing 404 page when I access the Simple Stock Manager? You can exclude sub-directory from RewriteRule of wordpress by adding the line below to your .htaccess file in main directory of wordpress. Guide to add new language. Folder name should be without space and all lower letters. If you are getting the error "Unable to load the requested language file: language/yourlanguagename/form_validation_lang.php or calendar_lang.php" Then you will need to add your language in lib/language/ as you did above for app/language/ and translate the system language files to your language. Modify the select statement and select the desired column, in the controller. Add new element to datatables columns (should be in sequence) in the relative view file. Lastly add the th tag with column heading to table head (should be in sequence). Modify the select statement and remove the desired column, in the controller. Remove the element form columns of datatables in the relative view file. Lastly Remove the th tag with column heading to table head. We have used datatables library for all listing tables. If you need to change any table sorting column, you will need to modify the view file. You can change the sorting for any table by modifying the files as described here. Barcode page is designed to be printed with desktop laser printers. Barcode sheet or barcode pages have 2 columns' table (2 product per row and medium barcode image with 60px height). For labels, each label will be printed on different page as most of you will print label with label printers. We don't provide any support for modify the design. If you need to modify any of the barcode/label page to show/remove any information, you can do so by modify the products controller. The functions are mentioned that handle the pages. Yes, we do provide customization services to modify/enhance the item functionality to suit your needs. We charge $30 per hour. Please email to saleem@tecdiary.com to check availability, estimated cost and time.